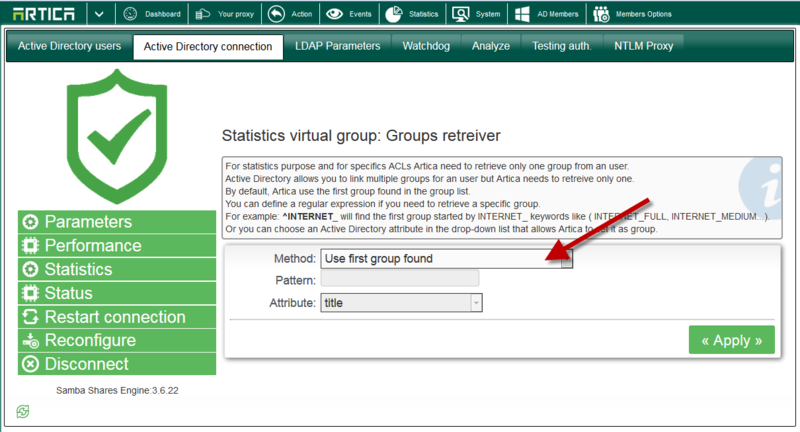 The 2.21.091200 introduce statistics by Active Directory group, for this purpose, Artica need to retreive one group from the user session. When found a group, Artica use it as a Virtual Group. 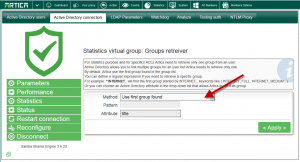 A Virtual Group can be used in ACLs and Quotas. On the Active Directory settings, choose Statistics button on left part. A dedicated section allows you to help Artica to found the right group. For statistics purpose, Artica needs to find only one group. 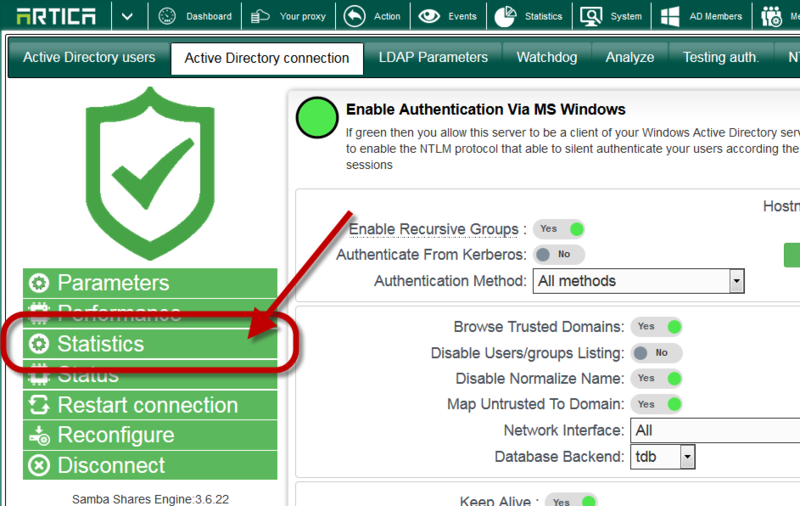 In Active Directory you can link several groups for one user. The main question is : What is the right group for Artica ? In most cases, some Active Directory groups are dedicated for users policies according rights on Workstation. In this section, you have a drop-down list that allows you to define how to find a group. By default Artica use : “Use first group found“. Artica retrieve the list of all groups according an user account and use the first one found. The “Find the group according a regular expression” option allows you to set a regular expression in the “Pattern filed” to help Artica to find the desired group. The regular expression grouping is supported. For example, a regular expression like: ^INTERNET_(.+? )_, will find a group with INTERNET_FULL or INTERNET_RESTRICTED group name. Using the grouping regular expression (.+?) defines the virtual group. ← Some Websites are strongly cached how to avoid it ?